RIDING LAWN MOWERS, $300 each, run good, new batteries. Call, (931)359-6398. PUSH MOWER for sale, $50. Another push mower for sale, $60. (931)247-6487. 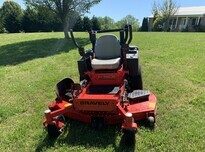 SELF PROPELLED mower, $100; 1642 Snapper, 42" cut, 17.5 horse motor, $500. (931)952-0153. CUB CADET lawnmower, motor good, needs deck work, $225. (931)952-3380.